The first thing you need to know is that you should watch it. For those of you who have never heard of this show, here's a quick summary. It's a cartoon about a young boy named Steven who lives with a bunch of magical rock ladies from space called the Crystal Gems. His mother was a gem, but his father is human, so he is half-gem and therefore is training to become a member of their kickass super-team. And they all have cool gem powers and fight evil. And before you ask, it's a show for the whole family. Like How to Train Your Dragon and Wall-E, which were enjoyable no matter what age you were. And if you didn't love those two movies, fight me in the comments. WHO HE IS: Steven is a half human and half alien-species known as "gem". His mother was called Rose Quartz and gave up her physical form to give birth to Steven. Other than that, he's a pretty normal 10 year old. He's enthusiastic, friendly, and inquisitive. His signature weapon is a shield or bubble force field. WHY HE'S AWESOME: He's the nicest, most genuine person. He isn't afraid of expressing his feelings and sharing his passions. And he plays practically every instrument and sings the cutest little songs about his friends. Basically he's like this tiny cupcake of a child with so much freaking love inside of him. 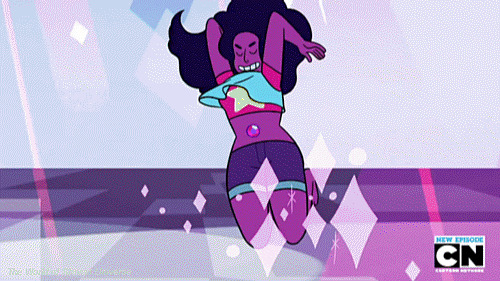 WHO SHE IS: Garnet is the unofficial leader of the Crystal Gems. She's calm, stoic, and sensible. She tends to act on intuition and is usually right. She is the strongest of the gems, and her signature weapons are stone boxing gloves. WHY SHE'S AWESOME: She's basically the coolest person ever. Everything she says is wise and perfect. Except for a few hilarious times when she finds herself at a loss. Then she ends up shaking old people or telling mothers their children are playing with swords. WHO SHE IS: Amesthyst is sassy, messy, and boisterous. She's the most childish of the gems and is more of a sister to Steven than a surrogate mother. She can be hot-headed but is usually pretty easy-going. Her signature weapon is a whip. WHY SHE'S AWESOME: She's basically the partner in crime you always wished you had. She doesn't give a crap about what people think of her and does what makes her happy. And her style is bangin'. WHO SHE IS: Pearl is an intelligent, analytical perfectionist. She worries and fusses the most over Steven and had been the closest to his mother. She's graceful, responsible, and sentimental. Her signature weapon is a spear. WHY SHE'S AWESOME: She is the least adjusted to life on Earth and often hilariously misunderstands the culture and customs of humanity. But she's extremely well-versed in tons of different subjects, and at one point she just BUILDS a ROCKET SHIP. Greg is Steven's father. He met Rose Quartz when he was in a one-man band. Now, he lives in his car and runs a car-wash station. But he's actually really happy with his life. He loves his son like crazy and is just the nicest and most supportive father. Connie is an adorkable introverted bookworm with strict parents and strong opinions. Because her family moves so much, she has a hard time making friends, and Steven becomes her first. They also have the sweetest little crushes on each other, and it's so cute you could die. Lars and Sadie both work at The Big Donut to which Steven constantly goes for delicious doughnutty treats. Lars is a bit of a jerk, but Sadie is a beautiful kindness goddess. Sadie has a huge crush on Lars, and later he's revealed to like her as well. Cute, cuddly, and a portal to an alternate universe. No one knows what this creature is. It's terrifying and I hate it. The good guys dance. The villains dance. Random people dance just YESSS BEAUTIFULLY CHOREOGRAPHED ANIMATED DANCING. Whether with fists, weaponry, or sometimes just wit, it's awesome. And I'm not just talking about in character design. (Although seriously, check out these character designs.) There's diversity in practically everything. From Steven's made-up songs to background music to literally the best song ever, "Stronger than You" by Grammy Award winner Estelle, this soundtrack will just make you happy. I promise. Oh yeah. That's Nicki Minaj up there. Yes please. Voice casting is just dead-on and really amazing. And mostly, POC actors are cast to voice POC characters. 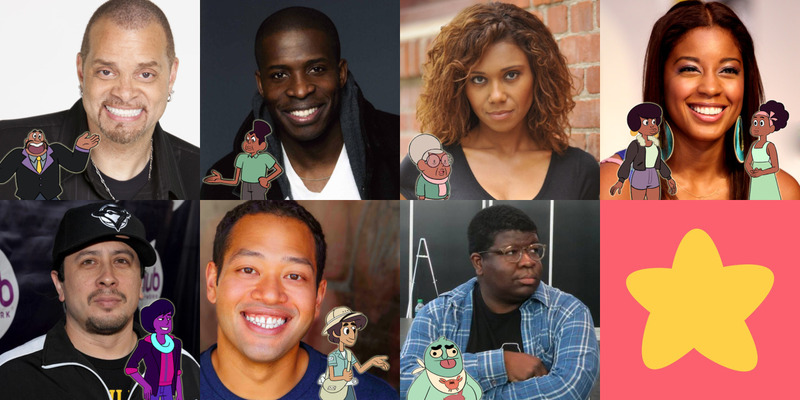 Although ideally all POC characters would be voiced by POC actors... In case anyone working in animation is wondering. The characters are loveable. The storyline gets unexpectedly and amazingly and complex and deep. It makes you happy. Just. Watch it. You'll be glad you did.